There’s no catchy introduction to this article. If you don’t know what spaced repetition is, give yourself a few minutes to read these few words, it might change how you study. 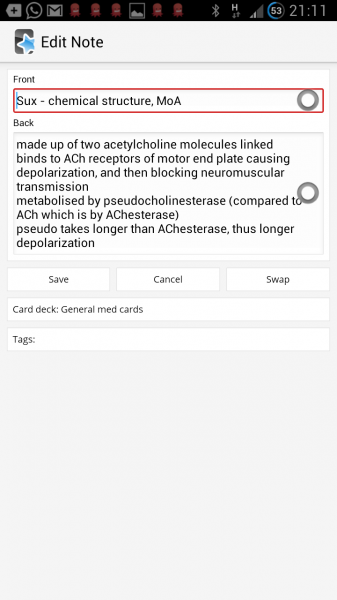 Anki is an app that uses spaced repetition and flash cards to help you learn. It’s simple and quick to use. It can help make meaningful use of those random few spare minutes that pop up throughout the day to learn new things and store them in your long term memory. It’s a fantastic tool for life-long continuing medical development as well as an incredibly smart tool for dedicated learning towards primary examinations. 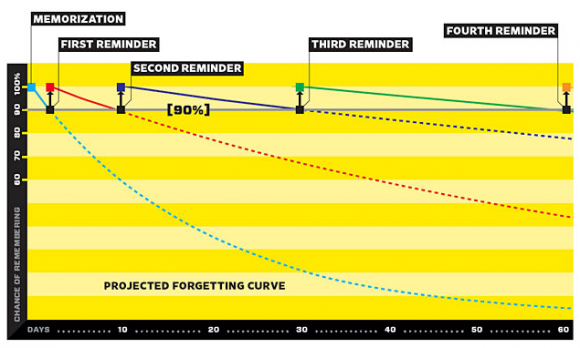 Spaced repetition isn’t new. It was born sometime around the 1930s, though remained in its infancy until more recent times. The premise is pretty unremarkable, mostly common sense, and stirs one of those “why didn’t I think of that” reactions in most people I talk to. When you learn something new, you will eventually forget it. If you revise it, you’ll remember it longer. If you revise it enough times, it’ll end up in long term memory. The magic here is when you should revise it and how to keep track of all the new knowledge in some form of database. I won’t go into the minutiae of the history, as there’s a fantastic, often referenced, Wired article here to read. As you can see, rehashing new knowledge slows the decay of knowledge. Anki is one of the many apps available that employs spaced repetition. It’s my personal app of choice as it is device agnostic, well designed, and easy to use. I strongly believe that design is essential to functionality. It’s hard enough to get motivated to study without a poorly designed user experience creating yet another barrier and excuse. 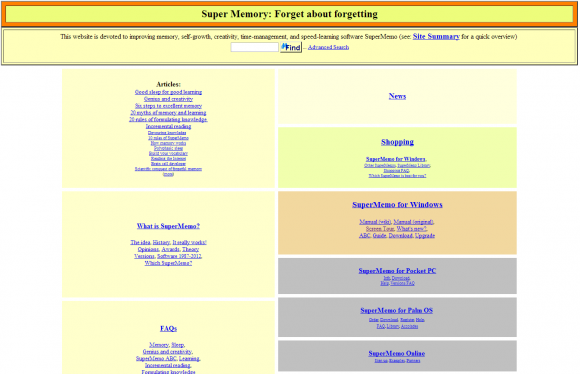 Early software options such as Supermemo from the 2000s were hideous. These days it’s somewhat less painful on the eyes, though back in the day it was an aesthetic abomination. Have a look at a screenshot of the current website for an insight. Truly a champion of function over form. Anki seems to find a balance. Anki is available on Windows, Mac, Linux, iOS, Android. There is also a web-version available and all the options are cloud synchronized. Information is stored in a card, which consists of a question or prompt, and an answer. For example, “What are some common side effects of non-steroidal anti-inflammatory drugs?”, (Answer) “ulcers, renal failure, bleeding, asthma exacerbation”. Information can be entered as text, images, audio, and video clips. I use it to enter facts, pathways, concept maps, and diagrams. 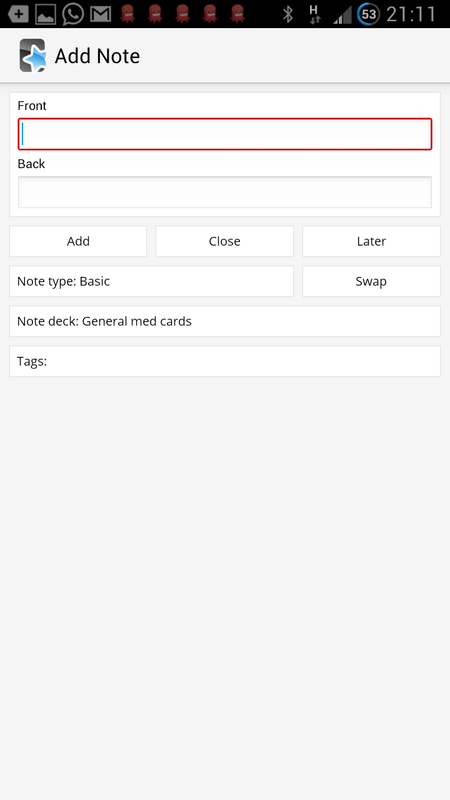 Stacks of cards can be separated into virtual decks for organization. I have general medicine cards, physiology, pharmacology, anatomy, emergency, cardiology, etc. 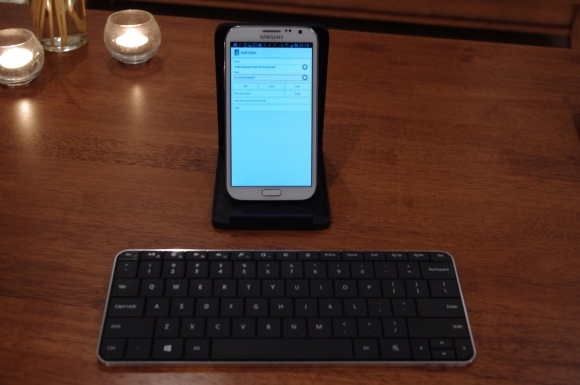 Material can be added using any of the device platforms, though it’s far easier using something with a dedicated keyboard. Revision is where the magic happens. The question or prompt of a card is shown, you try to answer it, review the answer, and then rank how well it went. Anki uses its algorithms to work out when you need to review it again to most efficiently learn and memorize the material. This is Anki in its most basic form. There are a multitude of options to customize your experience and personalize your study habits. I work in the Emergency Department and am currently studying towards my anaesthetic primaries. In both my personal and working life I find that I’ll often have an odd minute or two to spare. 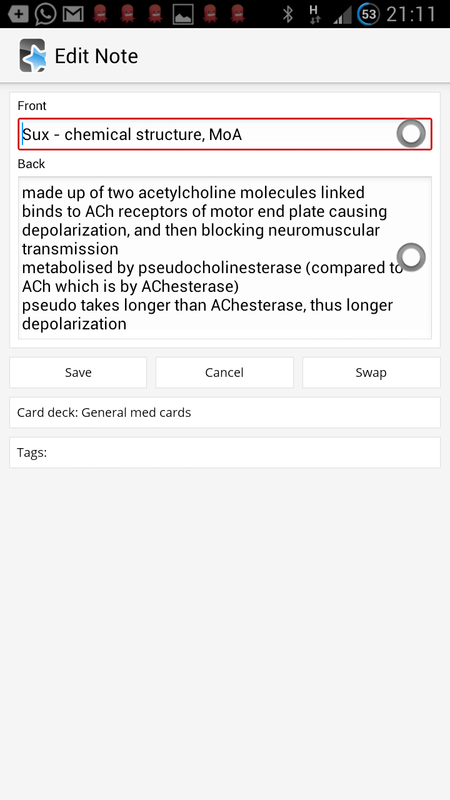 When I manage to overcome the urge to waste it on Reddit or stalking friends on Facebook, I’ll use it to either enter new data to Anki or review cards. Entering data on my phone is a bit of a pain. This isn’t something unique to Anki or my Note II, but more pervasive to phone keyboards. To overcome this I use a Bluetooth keyboard. My weapon of choice is a Windows Wedge keyboard. A good compromise of size and comfort typing. 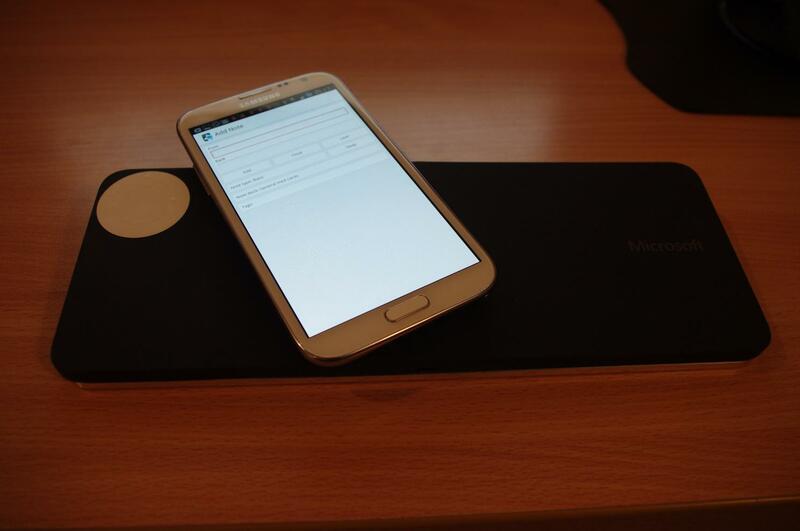 It also comes with a handy stand to prop up my phone with. Being a tech nerd, I’ve set up a NFC sticker on my keyboard that when activated, turns on my phone, opens Anki, and pairs my phone to my keyboard. When I am between patients or making use of those rare ED spare moments, I can be ready to enter a new card in seconds. I find this is fantastic for learning on the go. Every patient is a chance to learn something new, and I’ll try to enter something after every patient. If I’m working night shifts, or manage to steal a computer for myself, I’ll enter cards online. 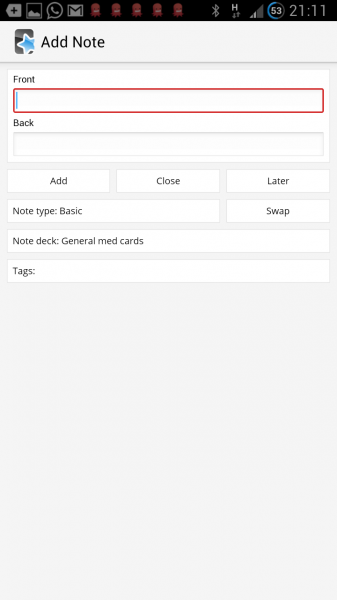 It’s as simple as switching from entering notes on a patient on the EMR to whatever browser you have installed to go to the Anki website. Job done in seconds. At home, in my dedicated study time, I’ll use a mixture of the desktop version and Evernote to enter chunks of text, concepts, and diagrams / images. This is where the design of Anki shines. I have it installed on my desktop, phone, and tablet. Hallway moments, elevator rides, waiting for transport, in line for coffee, and yes, in the loo. Each of these moments are potential study periods. I have the shortcut on my main phone screen to continually remind myself to use it. Eventually–with enough repetition–this all becomes a fantastically productive habit. I’ve often caught myself using knowledge and information in daily practice that I’ve learnt from some otherwise wasted scrap of time. It’s truly a fantastic way to learn things from the most basic, such as adult drug doses in resuscitation, to more esoteric things such as specificities and sensitivities of particular tests. I’ve particularly found it useful for memorizing and recalling information used in pediatric and neonatal resuscitations, something that is rarely used (in my practice) and vital to have on hand if required. Anki and–more specifically–spaced repetition are an incredible way to study more efficiently. Once you manage to form a habit of it, previously wasted moments become microstudy periods. These add up over time. It’s had an incredible impact on my life as a doctor, and I’m constantly amazed that more people aren’t catching onto the practice. I’ve included a few links to people discussing the topic, in particular one of my favorite medical blogs, Life in the Fast Lane.